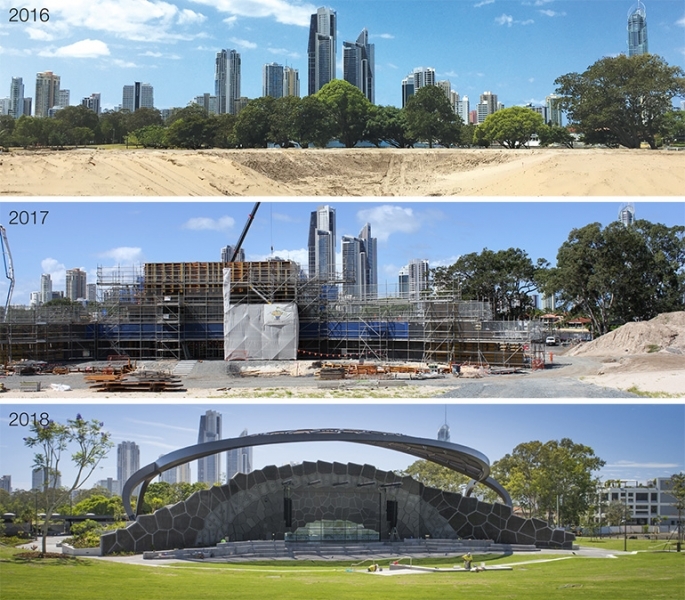 A STRIKING new cultural destination is planned for Australia’s Gold Coast. To be delivered on a 16.9 hectare site, within walking distance of Surfers Paradise, HOTA, Home of the Arts will be a heart for arts, culture and creative enterprise. It will become the Gold Coast’s place to be for residents and visitors alike. With new visual and performing arts facilities and a programmed outdoor Artscape, HOTA will support the city’s already thriving cultural evolution. Design team leaders, ARM Architecture and Topotek1, have applied their 2013 international competition-winning concept to a site-wide Master Plan. It will guide staged delivery of the project over the next 10 – 15 years. View the Master Plan. Early work started in 2015, enabling completion of the $37 million Stage 1 before the city hosts the Gold Coast 2018 Commonwealth Games™. Detailed design is also being prepared for an international standard city gallery and pedestrian and cycle bridge connecting HOTA with nearby Chevron Island and on to Surfers Paradise. Construction will start in mid-late 2018 for a 2020 completion. Council is working with HOTA, governments, business, arts and cultural organisations and the community to build partnerships, secure funding and activate what will be a must-visit artistic and cultural destination. To follow our progress, register for At The Precinct updates through the subscription box above.